This cookbook, Southern Girl Meets Vegetarian Boy: Down Home Classics for Vegetarians (and the Meat Eaters Who Love Them), is amazing! I am so excited to have the chance to make and share one of the recipes with you all! It is truly awesome to be able to collaborate with the ladies on this panel. Damaris, Nikki, and Terra all have their own Web sites with incredible food content. And now Damaris and Nikki both have a published cookbook. I mean, they say you’re only as good as the company you keep and well y’all…I feel like I lucked out. One of the reasons I was so excited to cook from this cookbook is because as a new (Flexitarian) vegan, I’m still learning about plant-based cooking. I’m getting better with every meal I make, but so many things are still foreign to me. Growing up, I never tried things like tofu, tempeh, seitan, etc. That’s where I’ve expanded my meatless repertoire the most in the last few years—trying various non-meat products and types of substitutes. In my home, we also do our best to stay soy-free. This is an allergy-based reason first, and then a health-based decision second. Eating as soy-free as possible is especially hard when eating vegan/vegetarian. Soy is in almost everything now—even bread and spaghetti sauces! This book is an amazing relief in that there’s something for everyone! I found so many plant-based recipes, vegetarian (of course!) recipes, and even recipes for our meat-friendly folks. I don’t know about you, but a book like that seems rare! I’m not sure one besides Damaris’ even exists! As I mentioned in Bluebird + Blackberries' Challenge #3 (Meatless Monday), I enjoyed traditional comfort foods as a child—and then all the way up to adulthood. 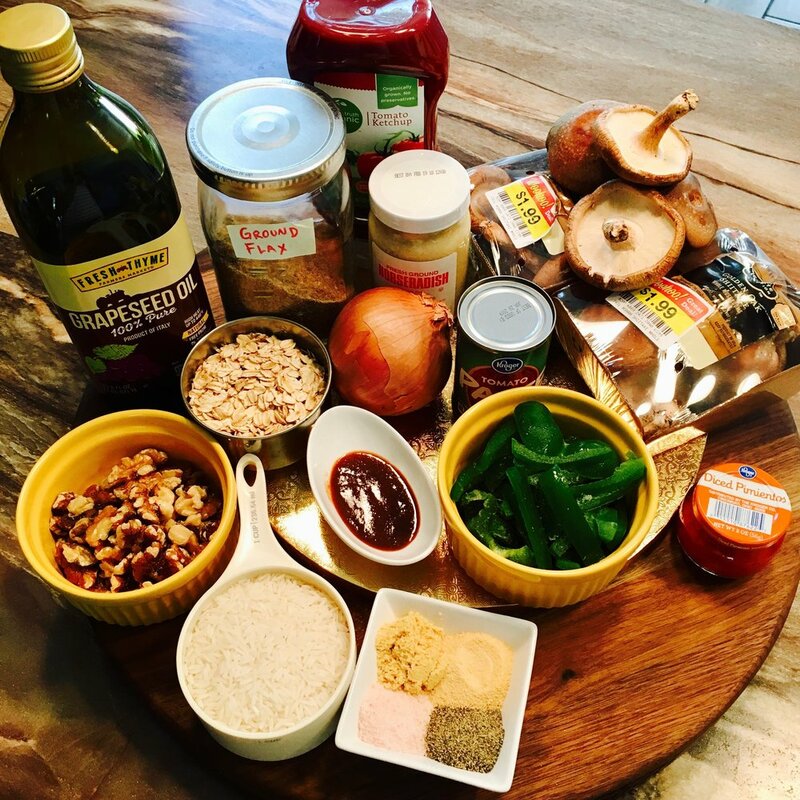 So when I found out there was a plant-based version of meatloaf in Damaris' cookbook, let’s just say I was super excited to try it (and that’s an understatement!). But, nope! You guys, this “meatloaf” is stupid delicious! “You’ll never guess!” I replied. “Its smells like meatloaf, or thanksgiving-kind-of-food,” he said. I couldn’t believe he guessed that just from the smell! And, let me tell you guys, he was super thrilled when I revealed what that smell really was! But back again to childhood favorites. My Mama always made meatloaf with mashed potatoes and gravy and peas when we were kids. We used to pile it all together in one big heap on our plates and go to town! 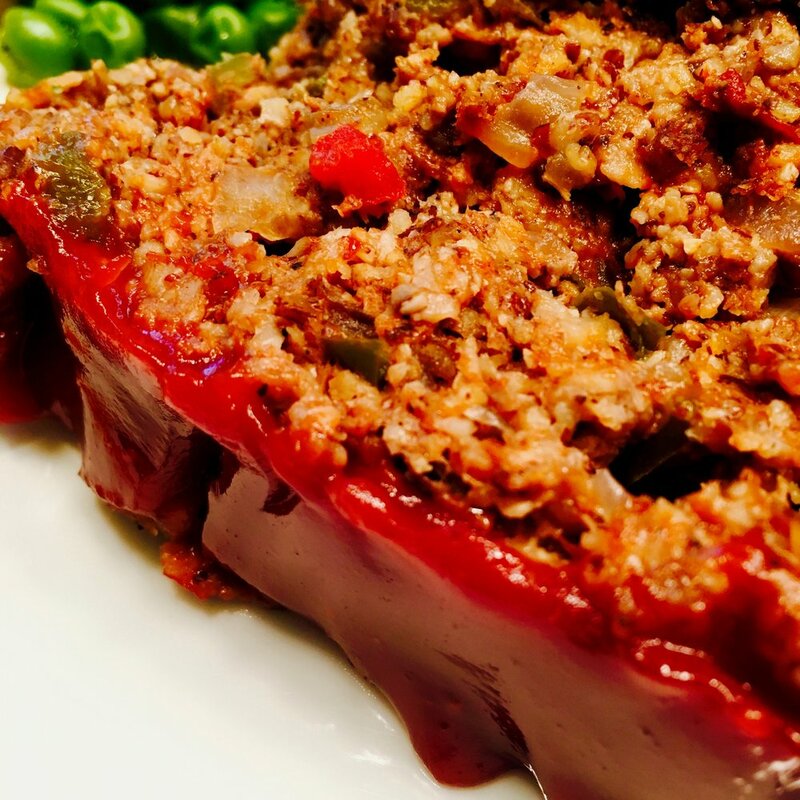 So, to carry on this tradition, I paired this wonderful veggie “meatloaf” with mashed potatoes, vegan tomato gravy, and peas. My husband and daughter prefer their food separated, but I piled high, baby. Oh my goodness, I’m drooling just thinking about it again as I type this! Anyway, do yourself a huge favor and make this! I would buy the book for this recipe alone! But I know Damaris has poured her heart and soul into every dish in this book, so it’s no doubt I will be making all of them! I will admit I made just a couple adjustments (for my own reasons, described below), but it was still phenomenal! When I went shopping for the ingredients the “meatloaf” recipe called for, I thought I had chia seeds, but it turned out I didn’t. So I used flax eggs instead and it turned out great! I also backed down the horseradish and nixed the siracha, only because my toddler is sensitive to spicy. She devoured it, and so did we! And after this awesome meal, we totally decided to make this a staple on our Thanks-vegan menu! 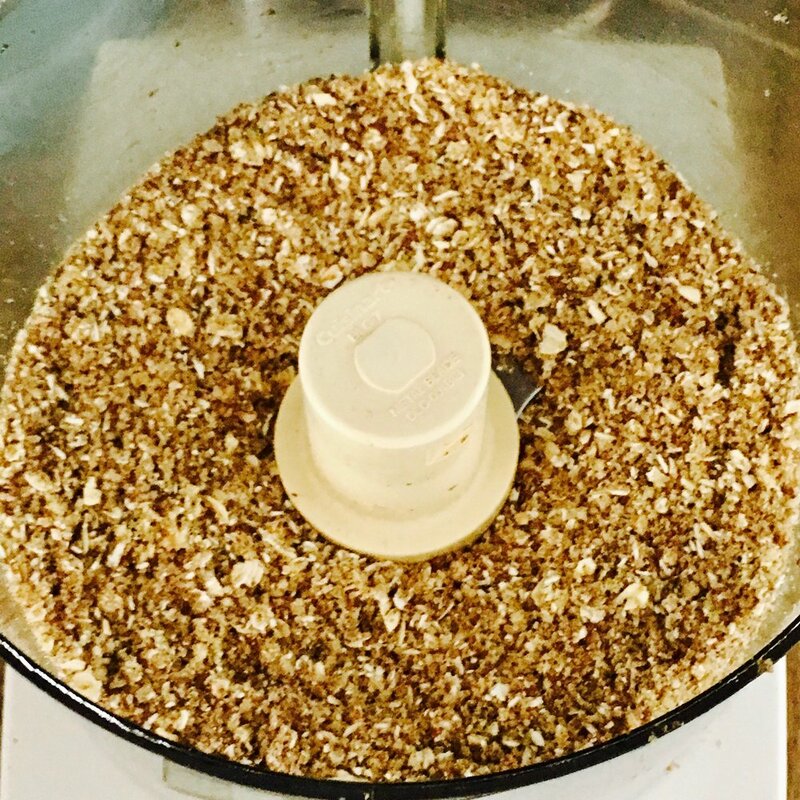 Add the mushrooms to a food processor and chop until very small pieces are formed, about the size of steel cut oats. Heat a saute pan over medium heat add the vegetable oil, (this will seem like a lot of oil, but it is ok) onions, green pepper and mushrooms, sauté until tender and much of the liquid from the veggies is evaporated, about 10 jk/minutes. Remove from heat and cool slightly. 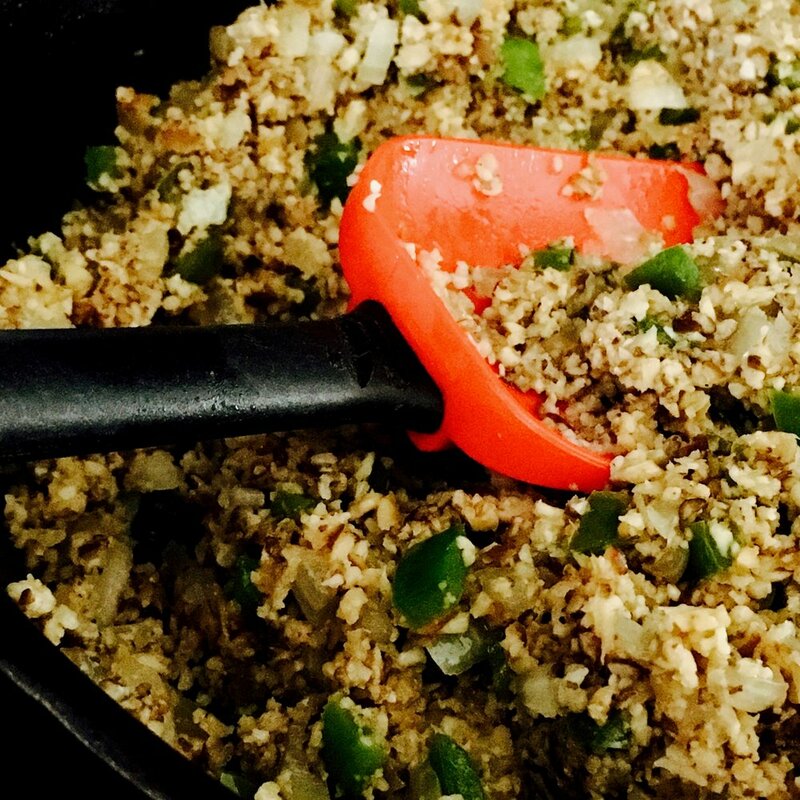 To the same food processor add the walnuts, oats, flax seed, dry mustard, garlic powder, salt, and pepper. Pulse until ingredients are well incorporated and a coarse mill is formed. Whisk together the eggs, tomato paste, horseradish, and worcestershire sauce. To a large bowl add the walnut mixture, pimentos, salt, pepper, tomato paste mixture, rice, and sautéed vegetables. Using a rubber spatula, stir until all ingredients are well incorporated. Mold into a 9x5x3 loaf pan and press to flatten the top. In a small bowl mix the ketchup and the 1/2 tablespoon of the siracha (taste it, do you want it spicier? If yes, add the remaining siracha). Spread the ketchup mixture onto the top of the loaf and cover with aluminum foil. Bake for 45 minutes until center is almost set. Remove the aluminum foil and continue to bake until the ketchup darkens, another 20-30 minutes. Remove from the oven and cool for 10 minutes before serving. Plant-based version: Replace the eggs with 2 tablespoons of ground chia seed and 5 tablespoons of water. Pour the water over the chia seeds and let it absorb the water for 5 minutes. Add the chia mixture to the recipe as you would the eggs. All other cooking methods and times remain the same.